Welcome to Horn Lake Elementary School! I am looking forward to a wonderful year with the HLES family of students, parents, and staff, and I know that we are going to grow together as we become better readers, writers, and thinkers. 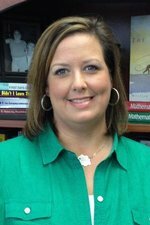 I am a 1997 graduate of Mississippi State University with my bachelor's degree in Elementary Education. In 2006, I became a National Board Certified Teacher, and I completed my master's degree in Educational Leadership from Arkansas State University in 2015. When my husband and I moved to DeSoto County in 1997, I began my career in education as a third-grade teacher at Shadow Oaks Elementary here in Horn Lake. Over the past twenty years, I have taught in Horn Lake and Olive Branch before becoming a district literacy coach in 2012. That position gave me the opportunity to support teachers across the district in literacy instruction from kindergarten through eighth grade. I have loved every school I've been a part of in DeSoto County, but all of that time has been preparing me for my role here at Horn Lake Elementary School. My favorite job in the world is being mother to my two daughters, Caroline and Anna Clark. I am so grateful that they are growing up in our DeSoto County Schools, and I promise to give every child at HLES the same love and respect that I want for my own girls. If I can ever be of any help to you or your child(ren), please don't hesitate to contact me through email at kim.bridges@dcsms.org or by calling the school office at 662.393.4608.